There's a reason for the high ratio of fluffy-toasty marshmallow to the more modest layer of rich, dense chocolate ganache. It strikes a balance! 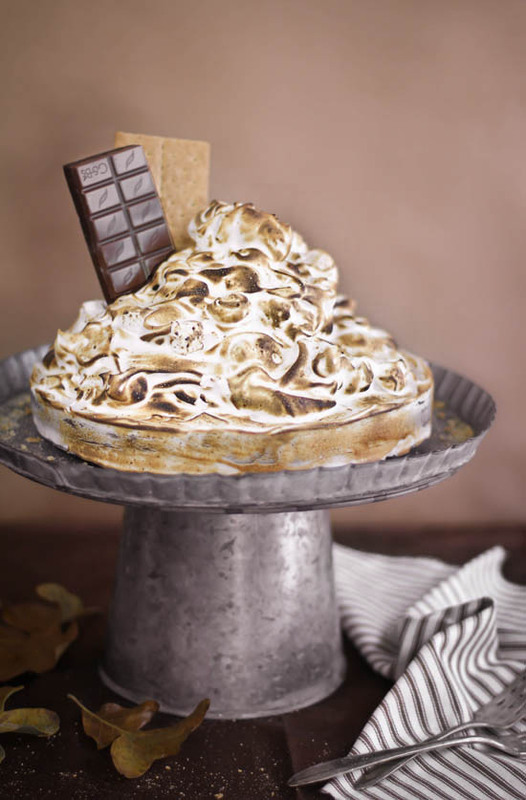 And the graham crust is essential - you can't have a proper S'mores Pie without graham cracker in the mix, right? There's not a lot of time investment in making this pie, but you'll have to wait around for the chocolate ganache to set. If you're impatient like me, you can stick it in the freezer to speed things up. Feel free to adjust or omit the bourbon in this recipe. It does not greatly change the consistency of the set ganache. Whisk together crumbs, sugar and salt in a medium bowl. Add melted butter and stir until mixture resembles wet sand. Press into the bottom of a 9-inch pie pan or spring-form pan. Set aside. Heat the heavy cream in a large saucepan over medium-high heat until very hot but not boiling. You may also heat the cream in a heat-proof bowl in the microwave at 1 minute intervals. Remove cream from heat source and pour in the chocolate. Let stand for 3 minutes. Whisk until chocolate has melted and mixture is completely smooth. Whisk in bourbon. Pour mixture over the graham cracker crust and refrigerate several hours until set (or store in the freezer for quicker setting time). Beat egg whites, vanilla and salt at high speed until foamy. Gradually add sugar 1 tbsp at a time, beating until stiff peaks form. Beat in 1/4 of the marshmallow creme. Repeat with remaining creme until meringue is well mixed and fluffy. Fold in mini marshmallows with a rubber spatula. 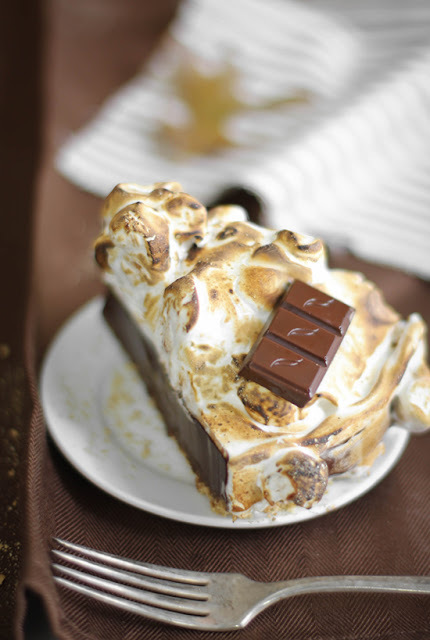 Heap meringue in the middle of the pie and swirl with the back of a spoon or spatula. Brown with a kitchen torch. You may also brown in the oven on the "broil" setting, but be sure to watch it constantly so the meringue does not burn. Keep refrigerated. Garnish with chocolate bar and whole graham cracker. Bring slices to room temperature before serving. Mountain of Marshmallowy Magnificence! Love the addition of booze to make it "grown up"! seriously?! I will say it ... everything that you post makes my mouth water. and is beautiful. thanks for sharing (everything) and i can't wait to try this one! you are BRILLIANT. seriously awesome. OMG, that is A BOMB! What a fabulous pie. I love your autumn pictures. Is there another way to do it without the whites...they always freak me out! I so want to make this though! Looks fabulous. I recently made s'more cookies which was a mission because I had to track down graham crackers in London. Definitely worth the hunt and now I can make this with the rest, yay! @imagretch if you have an egg allergy, you could just top the pie with the marshmallow cream and toast it - but if it's the raw egg whites that are making you nervous then I'd suggest getting powdered egg whites. They are pasteurized and you can mix up the amount for three and replace fresh egg whites in this recipe. i'll take a little extra bourbon...maybe on the side ;) looks amazing! Oh Heather this recipe is absolutely amazing! I love your pics, they look great as always! Beautiful..I will be buying your book..You're amazing. This sounds so perfect for a cool autumn night. What an awesome way to do S'mores! Heather this is just beautiful!! And I LOOOOVE your boots!! Woah. My brain seriously just fell out of my HEAD looking at this pie. I love that it's so pretty, I love that it's spiked, I just LOVE IT. And I LOVE YOUR BOOTS!!!!!! Every single recipe that you post looks so absolutely amazing. I could really use some of that pie right now. It's such a work of art! 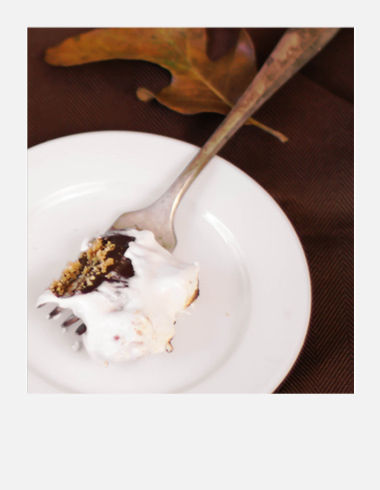 And the Bourbon ganache sounds heavenly and all mixed with smores...Heather, it's stunning! This looks DELICIOUS! I'm definitely going to try this one! Visit if you'd like to enter my vintage giveaway! Oh my goodness, this looks divine. Loving the height and the sound of the bourbon ganache too. And the cake stand is awesome too! Love that super thick marshmallow layer! Looks mouthwatering! Oh my!! That looks AMAZING! Wowzers. That looks incredible! Beautiful photos! This pie looks INCREDIBLE. :D What a fabulous dessert. The pie looks amazing....but even more, who makes the cake stand....I must have this. Aaaah I love that first photo. I want to dive headfirst into the meringue...is that wrong? OMG, I need this in my life! Are you kidding? This is gorgeous! L'aspetto di questo dolce è strepitoso, complimenti davvero!!! Not only do I want the pie, I want your dog (I'm allergic, sadly) and you must tell us where you got those fabulous boots! You are truly an amazing food artist! Only you can elevate the humble camp fire sm'ores to a whole new level!! A woman after my own heart. I can hardly think chocolate anymore without finding a way to add some bourbon. This really moves my favorite Girl Scout treat to a new adult level! Gorgeous. 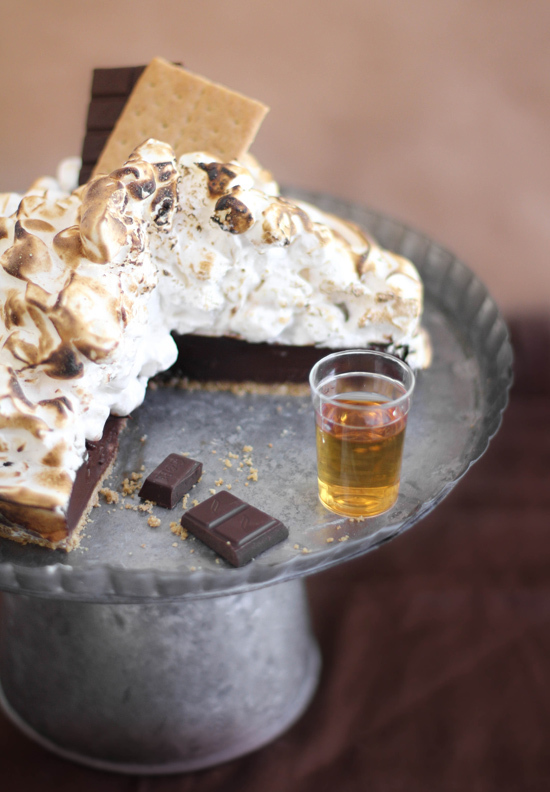 S'mores & Bourbon? Yes please! What a showstopper!! Adding this to my lists of must-makes! Probably the most stunning pie I've ever seen!! And I love those boots!!! Well doesn't that just look amazing. I'm going to have to try this out next weekend! Is it wrong that I want to take a nap on that delectable marshmallow cloud? i still cannot get over how incredible this is. INCREDIBLE!! Oo, bouuuuurbon. What an idea. I love the marshmallow top. Looks gorgeous, and must taste killer. Gotta make it! Oh. Man. I need now! Seriously amazing sounding and looking, great job..
All that meringue is just amazing, piled so high! I expect to see a tiny, little skier on the slopes:) What an awesome pie! Yummmm....and now I'm wondering how it would taste with Bailey's instead of Bourbon!!!! May have to experiment! This looks absolutely lovely and I'm going to try it tomorrow, I was just wondering do you not melt the mini marshmallows? No, you don't melt the marshmallows, you just fold them in. The moisture from the meringue makes them soft and fluffy. It's so good. This would definitely cure what ails me! * I bought mini bottle of white jim beam bourbon- do you think it a appropriate/fit for the ganache recipe? * and more important: do you think that i can reaplace about 20%-30% of the ganache with high quality milk chocolate? i would be happy if you'll find the time and answer me..
so don't be intimidated if you're new to cooking! tastes amazing. great way of incorporating a classic into a more presentable dessert. 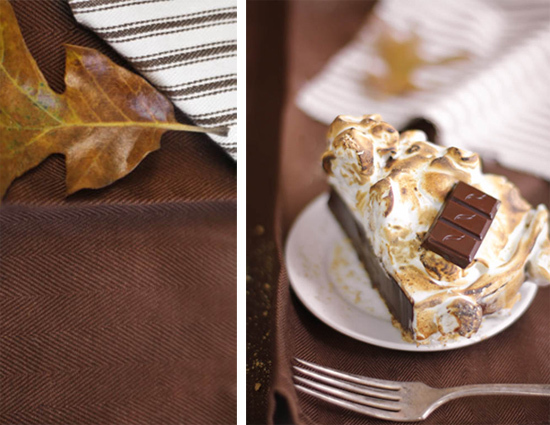 Like everything else you make, this pie is GORGEOUS!!! I want to make it (along with several other pies) for a fall party...how far ahead can it be made? Thanks for another beautiful dessert! 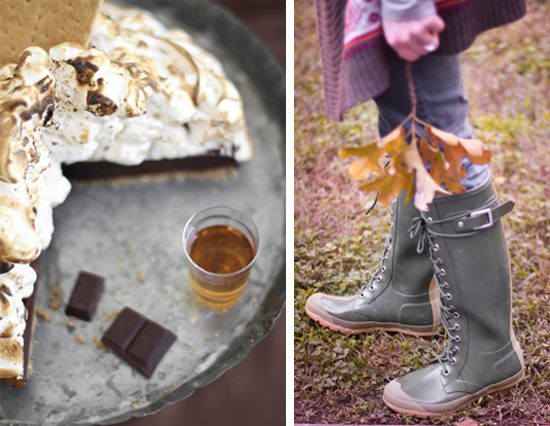 The pie looks amazing... could you also tell me where you got your gorgeous wellies!! My birthday is October 12th and my son's is October 17th. I always make a cake for the two of us sometime in the middle, and when he saw this picture over my shoulder, nothing else would do for his 11th birthday. I made it without booze, finally got to use the kitchen torch I'd been gifted the year before, and had FUN making it. The fact that it was also delicious was just an added bonus. I have a feeling I'll be making this one for lots of years to come. I love this recipe! I put cherry brandy in instead of the Bourbon and it may be my New Favourite Thing. Thanks! Please can anyone tell me where I can buy a metal cake stand like this ? Made this for a party. Chocolate was way too rich. Looked great but almost too rich to eat. I followed the instructions, checking twice, & the ganache was runny. I had to freeze it overnight last night to get it to set. Any thoughts as to what went wrong?